We are a CPCS & CSkills Award Accredited Test centre for Training and NVQs. All our instructors and assessors are highly knowledgeable with many years real life industry experience. Ainscough Training is one of the UK's largest independent, specialist training providers, delivering training to industries wherever lifting operations take place including construction, manufacturing, engineering, and transportation, aerospace, renewable energy, utility sectors and the MoD. There are no hidden costs and we accept MoD resettlement funding and Enhanced Learning Credits (ELCAS). We offer cost effective ways to go from CPCS Red Card to CPCS Blue Card. Our training exceeds industry standards and our all-encompassing service, involves comprehensive communication and after care. Including a dedicated team of competent administrators to support you through the booking, training and post course process. Training is delivered in our outstanding learning environment at our bespoke training facility in the North West. Training & NVQs are available at clients own sites, throughout the UK & overseas. We deliver a wide range of CPCS, non CPCS and bespoke courses and NVQs. Allowing employers to ensure the workforce is up to-date with all relevant legislation and codes of practice. Our vision is to be the UK's No.1 choice for Training & NVQ's for Safer Lifting Operations. 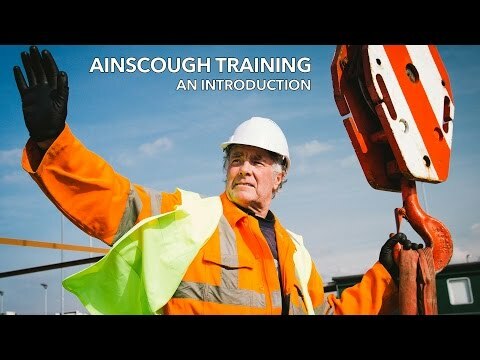 Ainscough Training Services Ltd is one of the UK's largest independent, specialist training providers. I would just like to say a big thank you to all at Ainscough Training Services. From our very first phone call back in May and to everyone from my first day at training. The service you have provided has been second to none. You restored my confidence after a bad experience with another service provider. A big thank you to Steve and Keith for their excellent input and ideas in training and also Graham for his calming influence in my practical exam. They are a credit to your company. I would not hesitate to recommend you to anyone in the future. The instructor (Gary) was very knowledgeable and enthusiastic. He presented the training material very well. The classroom was pleasant along with the whole building and the hospitality of everybody at the training centre. All in all a good experience and a big thank you to Gary for his training and getting me through the week and achieving a pass result. I cannot speak highly enough of Graham, he is extremely knowledgeable, friendly and approachable, always willing to answer questions and give sound advice. Richard the MD took time-out of his busy schedule one Friday morning to provide me with a brief overview of the requirements of the AP NVQ qualification.From initial registration, through induction and beyond. I found the course a most enjoyable experience. Thank you, A most professional approach at all stages. A very helpful and supportive company. Ainscough Training Services have supported me through the whole process; from our initial meeting at the TATA Steel Works Job Fair, to introducing me to interview opportunities with a local crane company. I have thoroughly enjoyed my time at the training centre. I have been able to take advantage of the funding and achieve a CPCS card for Slinger & Mobile Crane and I am now ready to start a new chapter with a career that can effectively support my family. The assessor created a very relaxed and professional atmosphere for the practical and theory assessments. The admin support team provided a very polite, professional and punctual service. I would most definitely recommend Ainscough Training Services,the standard of the course and instructors was excellent. Owen was very professional and courteous throughout the entire NVQ process. He did not rush, kept me informed and on task. The administrative process was easy and straight forward, with courteous and pleasant staff to work with. I would highly recommend Ainscough, and will be looking at using them soon in the future. Please pass on my thanks and appreciation to Jim. I am not easily impressed by a trainer and usually make a very difficult student! Jim was clearly extremely experienced in the area he teaches, has a wealth of knowledge and is able to explain it in a simple and concise manner that makes for very enjoyable learning experience. "I had my second meeting with Paul Dunn late on a Friday night due to the fact I work away in London and this was above and beyond what I was expecting and really appreciated the flexibility. I had my assessment with Owen Smith via skype and again I found this to be a flexible way of working saving time. The Meetings and the assessment were both professional and relaxed. Both Paul and Owen were well organised and knowledgeable on lifting and made the overall process quite enjoyable"
I would like to thank you for the course held last week in Al Ain Abudabi UAE. The feedback from all attendees was extremely positive and your summary of their performance was really excellent. We look forward to working with you again in Panama and subsequently other regions that will undoubtedly appreciate your service.